Here is a quick yummy recipe that is great for a light main dish or as substantial side dish. I made it for dinner tonight along with a tomato salad and it was delicious. The recipe calls for using either green beans or snow peas, easily turning it from a spring to a summer dish depending on what is in season. I also loved that there is a lot of herbs in it as well! I got the recipe from River Cottage Veg by Hugh Fearnley-Whittingstall. A great book that focuses on using vegetables as the main ingredients. The only thing I subbed out was a serrano pepper for the red chili. Other than that, I pretty much had everything on hand. Yippee! (That doesn't happen very often!) This also happens to be a vegan dish for all you who are interested. If using raw peanuts, roast on a baking sheet in the oven (at 350°F/180°C) for 8 to 10 minutes, until golden brown. Leave to cool, then lightly bash the nuts to break them up a bit. Cook the noodles according to the instructions on the package. Drain and rinse under cold water. Add to the dressing and toss until well coated. Leave to cool complete in the dressing. Cook the beans and/or snow peas in a saucepan of lightly salted boiling water until just tender and still a bit crunchy, 3 to 5 minutes for beans, 2 to 3 minutes for snow peas. Drain, refresh in cold water, and drain well. Halve the cucumber lengthwise and slice thinly. Finely slice the green onions on the diagonal. 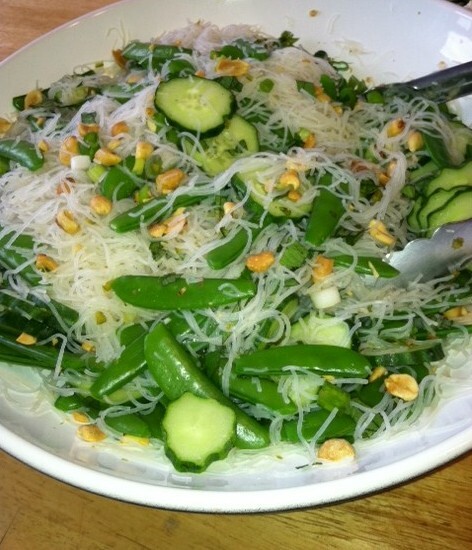 Toss the cooled noodles with the peanuts, cucumber, green onions, beans, and/or snow peas and herbs. Serve with soy sauce on the side for everyone to help themselves.